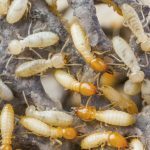 Termites are insects that consume wood and all other materials that contain cellulose. Although some structures are more prone to termite attacks, every building is susceptible to a potential termite invasion. Termites are considered amongst the most destructive pests in the world. Look for termite mud tubes (tubes built from dirt and other materials) in sub-floor area, foundations, skirting boards, cornices, mouldings and roof timbers.Soft floor boards, bulging, staining or rippling of painted timbers.Bits of dried mud falling from joints in walls when tapped.Some species of termites make a “clicking” noise which is usually heard at night time. We Are Specialist In Termite Control. CONTROLTermites are a group of Eusocial Insects that live in colonies. The ClearZone Man can come periodically to monitor your Premises and help prevent an infestation with TERMITES.